Radical Waters IP (Pty) Ltd. has recently been granted an exciting new patent in respect of the rehabilitation of Water Wells or Boreholes using its Electrochemically Activated Water (ECA) technology. 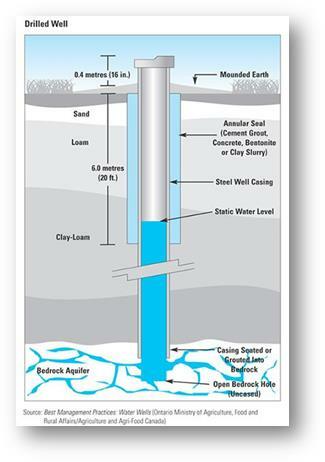 Water wells are drilled holes in the ground that reach down to an aquifer. Even though water in aquifers is usually very clean because sand and porous rocks provide natural purification by filtering out sediment and bacteria, over time wells are likely to experience water volume loss and biofilm problems. Underperformance occurs when there is an over accumulation of unwanted bio-material on the well’s solid surfaces, and since drilling of new holes is a costly exercise; industrial size wells are often treated and rehabilitated. “Conventionally there are different ways to rehabilitate wells. The most common of which involves high pressure applications using blended harmful chemicals and high temperatures (BCHT), which are injected into the wells to flush them out. This is not ideal, and one needs to consider the environmental impact of these harsh chemicals in these situations as well as the high energy requirements. BCHT poses severe restrictions, as the chemicals used are simply not safe. Chemicals could seep into adjoining wells during treatment, and there is no way to guarantee this does not happen” says Philip Nel, VP Technical & R&D, Radical Waters. As an alternative to the use of traditional chemicals, Radical Waters ECA technology’s, Anolyte (disinfectant) and Catholyte (mild detergent) is dosed into the well to attack living cell components inside the well, the gravel pack and in the rock formation surrounding the water well. Like other typical treatment processes, Radical Waters solution involves three phases to remove the plugging biofilms (sticky masses). The first phase shocks and kills the bacterial cells in the biofilms using Anolyte, the second disrupts (breaks up) the biofilms and hardened slime, and the third disperses the biofilms and other plugging material. Radical Waters treatment procedure is also useful for aquifer restoration as the ECA solutions does not only clean the well, but it also penetrates the adjoining aquifer material where the solutions act on the hidden biofilm in this material. The Radical Waters patented invention can be summarised as: a method for rehabilitating boreholes or water wells. ECA solutions are used as a free flowing liquid, or is plunged, surged, fogged or introduced as a high or low pressure spray. Through the introduction of ECA’s Catholyte into the water well unit biofilm is loosened and suspended and some of the salts present in the well water, such as iron, are reduced and precipitated. Subsequently Anolyte is introduced to kill and remove the biofilm and other suspended organisms. For more information please visit www.radicalwaters.com or follow us on Face Book www.facebook/radicalwaters. Radical Waters (Pty) Ltd has spent 17 years focused on developing and commercializing its patented green ECA technology. The company has installed operating devices on six continents and in 26 countries primarily for blue chip companies. Radical Waters’ products are used in a wide range of markets formerly dependent on chemicals for controlling contamination and bacterial infection. The company has a focus on markets that include beverage production, meat & seafood, sauce manufacture, milling & starch and hospitality. Radical Waters (Pty) Ltd produces devices in its factory outside Johannesburg, South Africa. Radical Waters International (UK) LLP in London is responsible for international distributor relationships. ← PRESS RELEASE: Radical Waters Granted Additional Beverage Patent in Japan. Patents Also Pending in Other Countries.